J2 5100 Series Systems: The J2-5100 series system is a pan and tilt EO/IR camera system designed specifically for MRAP and Amphibious combat vehicles to provide all weather/all combat condition surveillance capability for wheeled, tracked andamphibious combat vehicles where day/night on-the-move 360 degree look up/look down capabilities were required. The system can be right hand or left hand configured. Using programmable presets, the system can be programmed to provide customized surveillance patterns or manually operated with a joystick controller to a contact of interest by a crewmember. The system is configured with a 36x optical zoom/12x digital zoom day (EO) color camera and a 1x/2x/4x digital zoom IR camera. 17-4 PH Stainless Steel spur gear pair driven by high precision stepper motor / gear head / gear head assembly. Dual spring energized rotary lip seals provided redundant particulate and moisture ingress protection and wear compensation. Equipped with exterior truncated cooling fins for improved passive cooling capacity. 13.3 Amps @ 24VDC, 100 us. 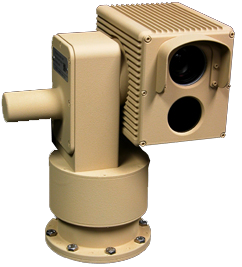 The J2-5104 camera head consists of two camera assemblies; one color (EO) zoom camera assembly and one IR fixed camera assembly. Video outputs are transmitted simultaneously.